We all like to be a bit mischevious every now and then. Thankfully, there’s one theatre company with shows in the West End which prove that not everything has to be serious these days. 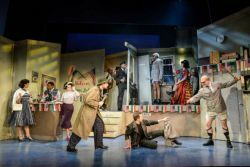 Stepping into the limelight are the Mischief Theatre company with their latest West End offering The Comedy About a Bank Robbery. Full of farcical moments and laugh out loud points that will make you giggle days after, there’s no time to waste on seeing a show that will make you smile. So, if you’re looking for a lighter West End production that still packs a (comic) punch, you’ll want to book tickets now for The Comedy About a Bank Robbery. The curtain lifts on Minneapolis City Bank in 1958, a bank which can’t be trusted at the best of times. When they come into possession of a highly-valued diamond, colleagues and members of the public have to be trusted to ensure that they don’t steal it. But, as the title suggests, it isn’t easy and planning for a bank robbery immediately begins. With mistaken identities and love triangles, who will you trust in this show? The Comedy About a Bank Robbery marks the second show for the Mischief Theatre Company, off the success of The Play That Goes Wrong and Peter Pan Goes Wrong which aired on the BBC. Playing at the Criterion Theatre since 2016, it’s sure to entertain kids of all ages from 11 to 111! So what are you waiting for? If you’re in desperate need of some laughter, you’ll want to go to The Comedy About a Bank Robbery. The cast of The Comedy About a Bank Robbery features nine people on stage. The show was nominated for best new comedy at the 2017 Olivier Awards. A French adaptation of the play, titled Le Gros Diamant du Prince Ludwig was first performed in 2017 at Theatre du Gymnase in Paris.